Rupert Pupkin Speaks: Shout Factory - HARLEY DAVIDSON AND THE MARLBORO MAN on Blu-ray ""
"It's better to be dead and cool than alive and uncool." Gosh, this film takes me back. Not to date myself too much, but I turned seventeen in 1991 which meant R-rated movies were a wide open opportunity for entertainment. 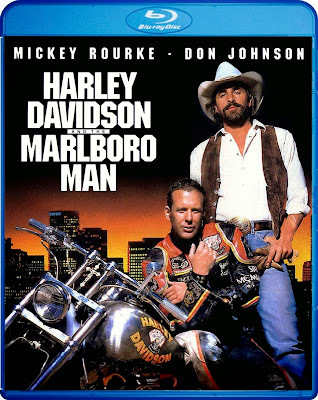 HARLEY DAVIDSON AND THE MARLBORO MAN opened in late summer (close to my birthday), so it was a perfect "because I can" R-rated movie for my good friend and I to go and see. We'd probably seen a TV commercial for it or something, but it was by no means a flick that everyone we knew were talking about. That said, we loved it. It was the perfect thing for that time and place. Don Johnson and Mickey Rourke were a great dynamic duo (or Butch and Sundance stand-ins). The movie had a certain immaturity to it and so much machismo that it was practically dripping off of every line of dialogue. I mean, the movie opens to Rourke riding his Harley while Bon Jovi's "Wanted Dead or Alive" plays in the background. Set in the dystopian future of 1996 (wherein gas costs a then unthinkable $3.99 a gallon), the film presents Los Angeles as a city akin to ROBOCOP's Detroit. 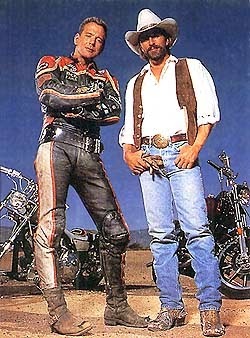 Harley Davidson and the Marlboro Man are old friends. When they find out that their favorite old Hollywood-themed bar in Burbank is being forced out of business, they hatch a plan to save the place. This movie has "cult film" written all over it. From the somewhat futuristic setting and quasi-western genre trappings to the eclectic cast (including Giancarlo Esposito, Tom Sizemore, Daniel Baldwin and pro wrestler Big John Stud) it feels all-around like something that may not connect with a wide commercial audience. And it didn't. It took in only about $7 million on an estimated $23 million budget and was panned by critics at the time. It's a situation very reminiscent of BIG TROUBLE IN LITTLE CHINA (one of my very favorite films), STREETS OF FIRE and many other movies that have proven to be much beloved over the years. Somehow though HARLEY DAVIDSON AND THE MARLBORO MAN never reached the same cult status as those others. It certainly has a cult, but I've never understood why it wasn't bigger. I'm quite pleased to see Shout Factory give it the old Blu-ray treatment as it is right in line with a lot of the cult movies that they've made it their mission to keep alive and kicking. Special Features include the original theatrical trailer and a vintage promotional featurette.